After a huge and lovely breakfast overlooking the lake, we set off for our half day city tour. 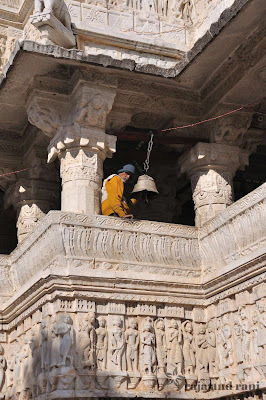 We started off at the Jagdish Temple which is in the main town. This Hindu temple was heaving with worshippers, tourists and generally, everybody! It was built in 1651 by Maharana Jagat Singh, who ruled Udaipur during 1628-1653 and is a fine example of Indo-Aryan architecture. 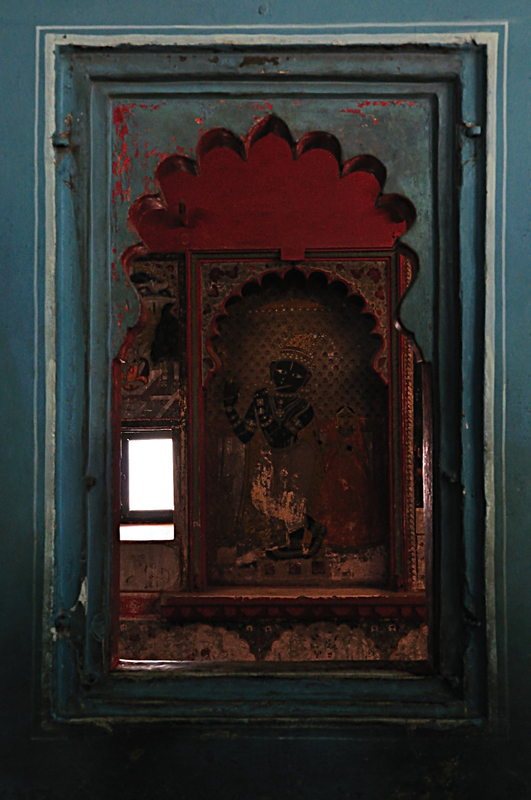 This three-storied temple comprises of beautifully carved pillars, decorated ceilings and grand halls. After a quick look inside and a wander around the outside of the temple to look at the intricate carvings, we headed out, as there were far too many people around! Just a short walk away is the grand City Palace which towers over the serene Lake Pichola. Made up of balconies, cupolas and towers, this awesome palace built on a hill is Rajasthan’s largest with a façade 244m long and 30.4m high. The palace has many chambers and large rooms, all superbly decadent in a fusion Rajasthani and Mughal architectural styles. 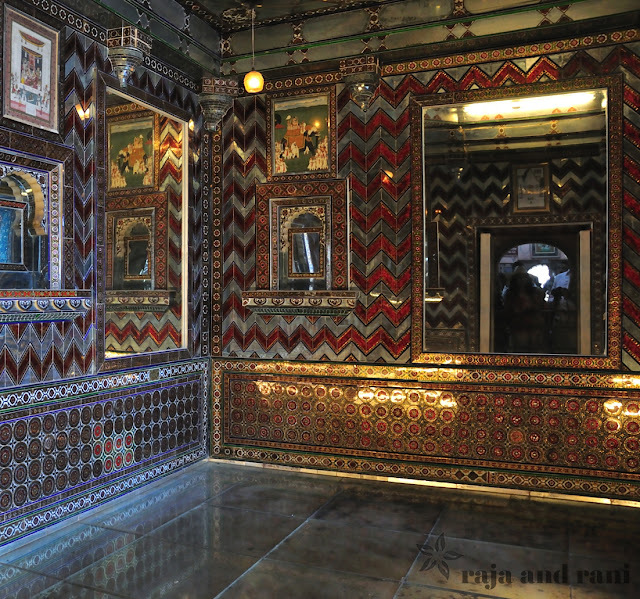 The rooms have names such as Manak Mahal (Ruby Palace) which is all decked out in mirror and glass-work. 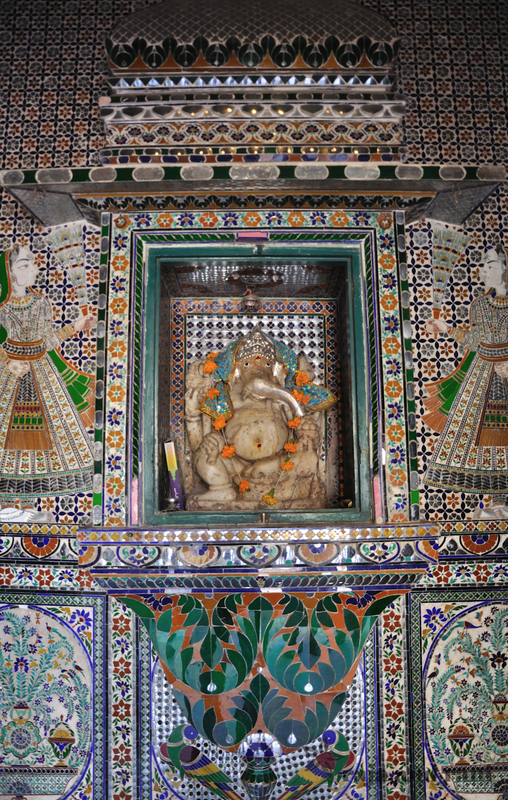 The Moti Mahal also has superb mirror-work and the Mor Chowk (Peacock Square) has gorgeous mosaics of peacocks in a sea of blue and green shimmering in the sunlight. 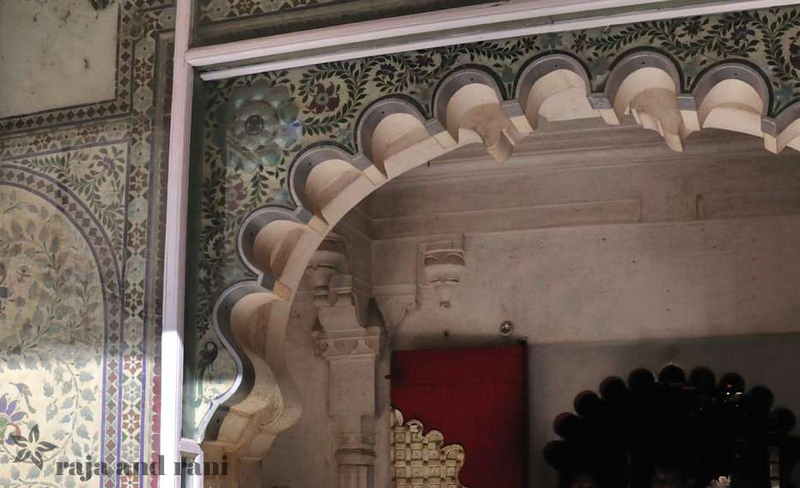 I was amazed at the intricacy and beauty of all this work and it made me wonder– 'was there no end to the opulence of these maharajas’? Many parts of the palace offer superb panoramic views of Udaipur and Lake Pichola so we stopped for a while and peered through the scalloped arches to see the milky white Lake Palace sitting serenely on the lake. After our tour of City Palace, we headed to the north of the city to the picturesque Saheliyon-ki-Bari (Garden of the Maids of Honour). This small ornamental garden, built in 1710, was a welcome haven from the rest of the city and this morning’s sightseeing. There were stunning fountains, marble elephants and even a lotus pool, all in lush green surroundings. The sound of the sprinkling water was instantly calming. 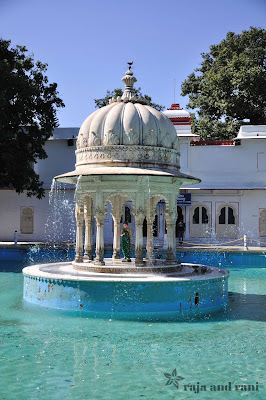 The garden was built by Sangram Singh II for the enjoyment of 48 female attendants which were part of the princess’s dowry and provided a place for them to enjoy and relax, away for the palace. We just strolled through the shaded walkways and enjoyed the serenity! By 5pm we had made our way to the jetty to board our sunset cruise of Lake Pichola. Firstly we went across the lake to a small island called Jag Mandir to see the palace which was built in 1620 by Maharaja Karan Singh. As we stepped off the boat there was a row of enormous stone elephants lining our path and as we headed to the rooftop to admire the view, I was amazed at how gorgeous everything looked from up here! 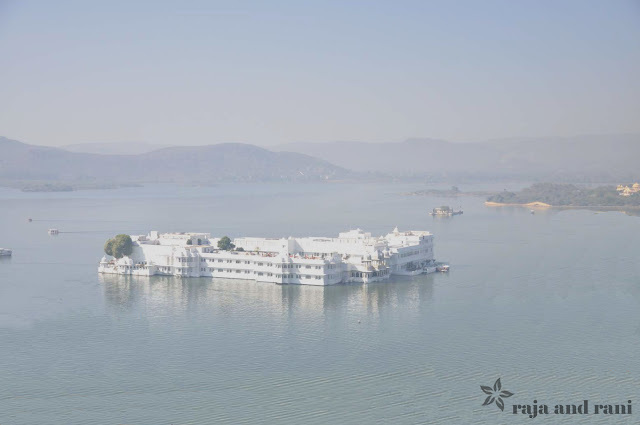 I could see the Taj Lake Palace and the City Palace all bathed in a golden light as the sun was starting to set. So romantic. 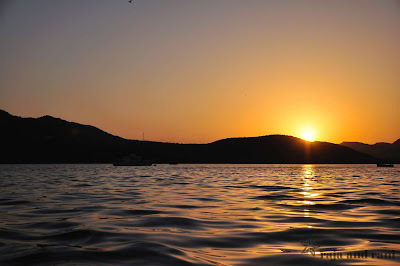 After about half an hour we headed back to our boat and cruised around the lake just taking in the sights and feeling so lucky to have experienced such a romantic end to our time in Udaipur. 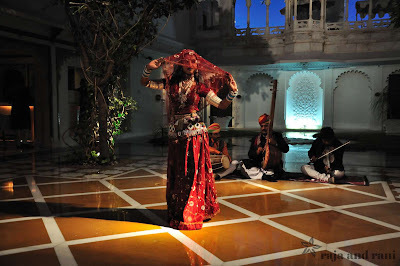 Once back at the hotel, we headed to the lobby bar to see a traditional Rajasthani dance troupe preparing for a show. Fabulous! We settled down in two front row seats, ordered cocktails and waited for the show to start. 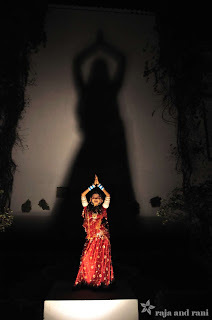 This girl could really dance! Canapés turned up without us even ordering them so after the show we stayed for a while to sip another cocktail before dinner. We got back to my room to find rose petals in a bowl near the huge bathtub and a note to say someone can come and run my bath when I’m ready. It was way too late, I was way too tired and we had an early flight back, so what did I do? 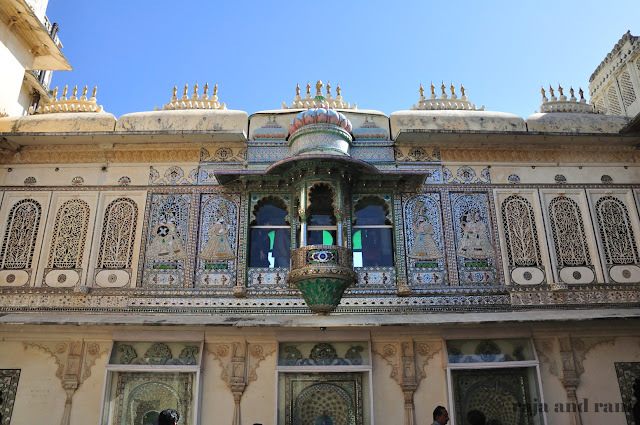 I got up at 5am the next morning, filled the bath, scattered the rose petals and enjoyed my last few hours in this truly magical place – most definitely the jewel of Rajasthan!